Standing on the tee of this stunning open hole you know you’re in for a great day! Everything feels so right, there is not a blade of grass out of place, you look down the fairway from the elevated tee, which is some 452 yards away which has the ocean as its backdrop. There are six tee options on this track with the yardage ranging from 7,173 to 4,426 yards. 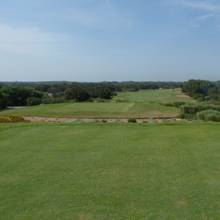 No matter what your golf game, Mogador has a set of tee options for you to enjoy and challenge your golf game. apparently was in Gary Players original plans, why he changed them I do not know, but in my opinion it wasn’t a change for the better. But don’t let that one element spoil what is a great golf course that you will love playing again and again, especially with the cool sea breezes, the track is in perfect position not only for the rolling terrain that helps give the course movement and definition but also to keep the heat away making your round all the more pleasant. 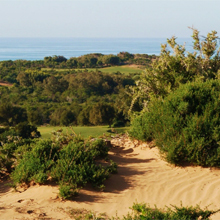 But don’t forget to drink plenty of water and use sunscreen and a hat, Morocco has a great climate to play winter golf and regularly hits the mid 30s so don’t be deceived by those cooling sea breezes. Stand out holes for me apart from the first, where the 444 yard, par 4 3rd hole, it’s a beautifully designed dog leg left, it’s all about position from this elevated tee. 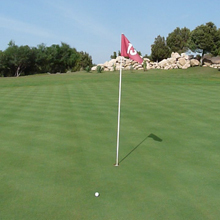 The 558 yard par 5 8th hole is a narrow dogleg right, its all down hill, so you can see everything in front of you and two good shots will get you home. Like the opening hole the 10th is another tee shot played from an elevated tee on this 456 yard par 4, you drive down into a valley so try to pick up as much distance as you can, you then play up the hill to the raised green. The 552 yard par 5 12th comes between two great par 3s, it’s a dogleg left with a bunker on the corner of the dogleg right in the driving area so accuracy is at a premium on this hole. The 16th is another par 5 measuring 533 yards, it’s a tight driving hole and you can see plenty of bunkers from the tee, but the hole normally plays downwind and with only a grass bunker protecting the green it’s a good chance to pick up a birdie.